Know your AED will be ready when you need it. It is commendable that more and more companies and institutions are adopting AED programs. AED’s are set up to be available to use in case of sudden cardiac arrest (SCA) and should always be maintained and checked to be in good working order. For this reason, many companies and institutions either enlist their staff or hire AED inspectors to check the status of their AED’s. Unfortunately, paid inspections are costly and diverting employees from their normal tasks costs valuable time. On top of that, human inspectors can make mistakes which can lead to a staggeringly high 1 in 5 AED’s not being ready for use. However, AED Sentinel® is a solution that eliminates the need for human inspectors, minimizes the risk of lawsuits, and most importantly, reduces the risk of AED failure and sudden cardiac death (SCD). AED Sentinel® is installed in your AED Cabinet and continually monitors the visual status indicator on your AED and notifies you of any change in status. 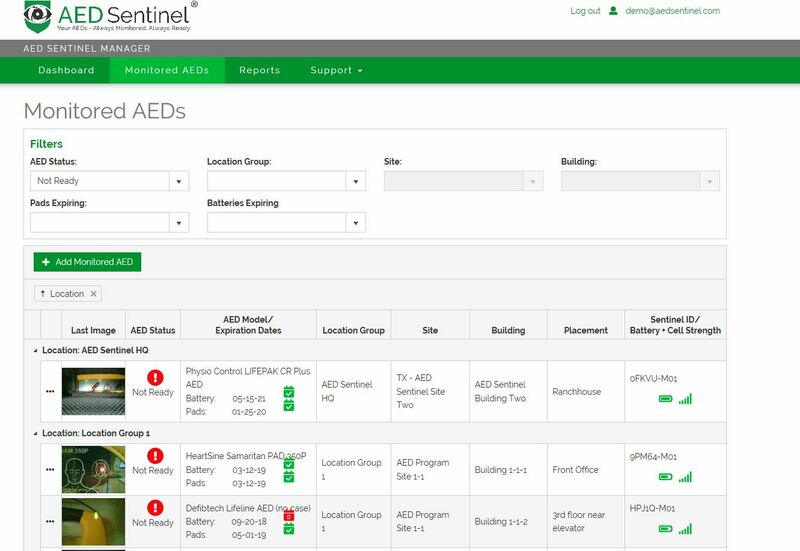 It also sends all information to the AED Sentinel® associated software platform where the intuitive user dashboard allows for monitoring, reporting, and alerts. It works with all current AED makes and models installed in wall-mounted cabinets. Simple installation allows subscribers to start monitoring quickly. Data is transmitted over a cellular network, so no hassling with the WiFi. Automated monitoring alerts you when the cabinet door is opened, the AED needs servicing, or battery or pads have expired via text and email. Reporting is easy in the web-based AED Sentinel® software. Check current AED monitoring results, current pads and battery expiration dates, and more! AED Sentinel® uses regular, off-the-shelf batteries that are easily replaced, so no need for a fixed power source. Hardware is protected by warranty for the life of your subscription. AED Sentinel® continually monitors the status of your AED’s, eliminating the need for human inspectors, saving you time and money. The annual subscription fee includes fully warrantied AED Sentinel® hardware, unlimited use of AED Sentinel® Manager software, and data and monitoring services for the life of your subscription. AED Sentinel® provides peace of mind, so that you know your AED will be ready when you need it. Check out AED Sentinel® and find a subscription plan that works for you.